The women’s cell of SBMJC, K.G.F. was established in the year 2013. The main aim of the cell is to look into the grievances of women. Women often feel neglected by society and thus the challenge lies in making them feel secure. Our institution therefore always has a holistic approach in addressing and handling these issues. We believe that ‘Prevention is better than Cure’ not only applies to an individual’s physical health, but also to the mental health and of a society at large. Members: Student members were selected from all the combinations to strengthen the Women’s cell and to make them realize their responsibilities. Women’s cell inauguration: The women’s cell was inaugurated on 13th January, 2015. 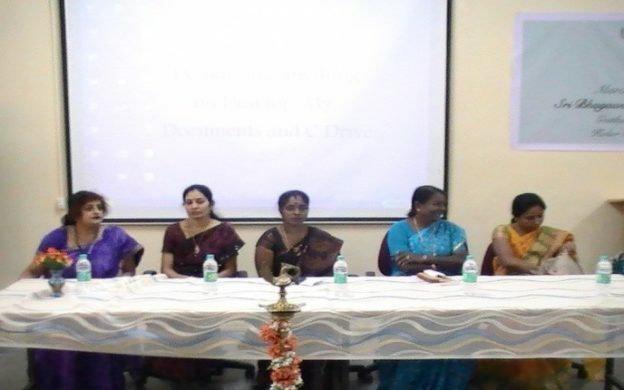 The guests were Dr. Geetha, gynaecologist, K. G. F., Dr. Jayasheeli, Principal, St. Teresa’s PU College, K. G. F., Ms. Sridevi, lawyer, K.G.F. and Ms. Shoba. Women’s Day Celebration:International Women’s Day is celebrated every year on March 8th. It celebrates womanhood and pays tribute to the indomitable spirit of women. The objective of the celebration of International Women’s Day is to review past progress of women’s development and more importantly, to look ahead at the opportunities of women and also to achieve gender equality and women’s empowerment. Women’s Day was celebrated in our college on 9th of March 2015. The teaching and non-teaching women faculty and girl students participated in the various events. Committee has taken steps and allotted duties to all the staffs members at almost all areas in the College( i.e. Canteen, Basement, Library, Open Auditorium of the College Campus ). All the three members are ensured that their presence at any particular time of location to avoid ragging activities. Wide canvassing about anti-ragging is being done in the forms of flexes, posters in college premises for student to access the right person. Grievances and Redressal committee is also made a part of these ragging activities.